Games continue to rise in popularity throughout New Zealand. #DNZ18 is the fifth report of it’s kind undertaken in NZ and is in fact on of the longest running research projects about game audiences in the world. 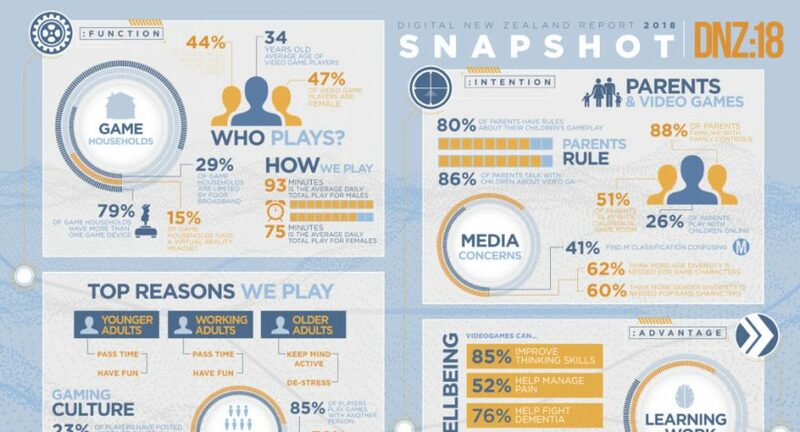 Through the Digital New Zealand series of audience studies that began in 2009, we’ve shown that almost all homes have a device on which someone in the home plays games. We’ve shown that the average player age has gone from the low- to mid-30s. We’ve shown nearly equal gender representation among players. We’ve also shown growing awareness and acceptance of the positive potential of games for culture and cohesion, for imagination and social interaction. Today the fun continues through interactive games. Their purpose is mainly to entertain and engage. Their progress is to inform and persuade, to educate and illuminate. They are used in schools and workplaces, in hospitals and other health care settings They are played by billions and made by millions all over the world. They are a celebration of human imagination, innovation and culture. FUNCTION : How do we play video games over the lifespan? When do we play them, for how long, under what social and environmental conditions and with what devices? MOTIVE : Why do we play video games in childhood and throughout life? INTENTION : How do we use games intentionally, with planning and rules to get the most benefit out of them and minimise real or perceived risk? ADVANTAGE : What social, cultural, educational, vocational or professional uses and benefits arise from games?